You can use checking profiles to centrally manage most plug-in settings on behalf of your users. When you use checking profiles, your users automatically receive the right settings after they start an Acrolinx plug-in. Checking profiles provide you with a way to group plug-in settings into profiles that cover specific use cases. For example, if you have two user groups who check with different writing guides, you can create a checking profile for each user group. After you create the checking profiles, you can select the writing guide that each user group should receive by default. Important: The server location, the GUI language, and the plug-in installation path are not controlled by checking profiles. These settings are stored in the registry of the client computer. Users must still define these settings themselves. 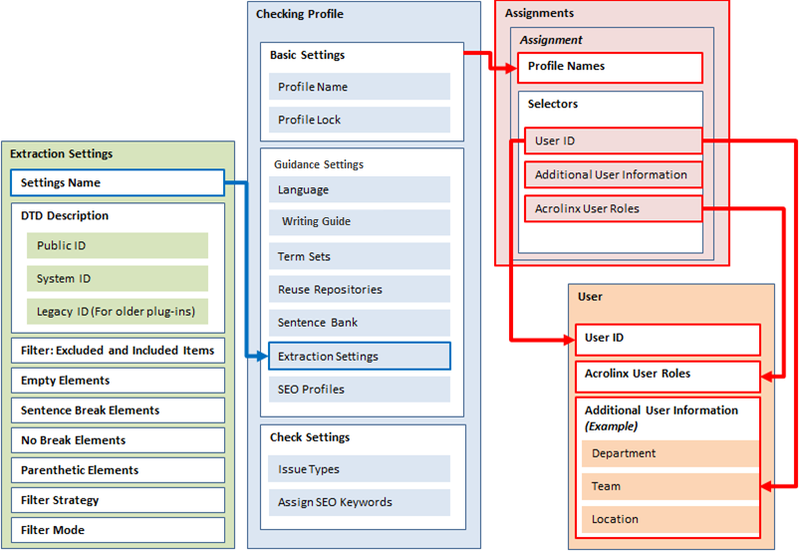 Before you start working with checking profiles, it is important to understand how they are structured. It is also helpful to understand how the old plug-in settings are migrated to this new structure. If you understand the feature structure and migration process, it is easier to troubleshoot issues with the plug-in settings. Checking profiles store all settings that affect checking behavior. These settings include the types of issue to check, the writing guide for checking style and grammar as well as the term sets for checking terminology. Checking profiles also include extraction settings such as the filter and segmentation settings for a specific document type. You ensure that users get the appropriate settings by assigning checking profiles to user groups. You can group users by their Acrolinx roles or by additional information such as department or team. You can also assign checking profiles to individual user IDs. The following illustration is an example of how you can assign user groups, checking profiles, and extraction settings. Users who have the Acrolinx role "Author". These users have the checking profile "Techpubs" assigned to them based on their Acrolinx role. This profile includes the "Techpubs" writing guide and all check settings that are relevant for "Techpubs". They work exclusively with DITA documents. Extraction settings for DITA tasks and concepts are included in "Techpubs" so that the users get the right segmentation and filter settings. Users in the department "Consumer Electronics"
These users have the checking profiles "Techpubs" and "Standard US" assigned to them based on their department. They work with DITA documents too, but some of them also work with Docbook articles. The Docbook articles require different style and grammar guidelines as well as different segmentation and filter settings. 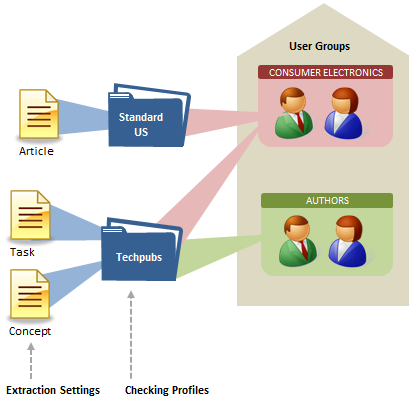 The checking profile "Standard US" contains the right extraction settings for articles. When these users work with DITA, they can select "Techpubs"and when they work with Docbook articles, they can select"Standard US". The settings in a checking profile are broken down into different sections. There are basic settings and settings that affect checking behavior. The settings that affect checking behavior are split into guidance settings and check settings. These settings include the checking profile name and the Locked option. You can lock a profile to prevent users from overriding the settings that you have configured for them. The guidance settings include the key components of your guidance package (formerly linguistic resources) such as language, writing guide, and term sets. They also include the extraction settings for your document types. The check settings define the issue types that users check for and any extra options that are associated with specific issue types. These settings are very similar to the settings that users see on the "Check" tab of an Acrolinx plug-in. All currently released plug-ins have some limitations in the way they work with checking profiles. We plan to create a plug-in user interface that makes it easier for users to work with checking profiles. This new user interface will be included in a future plug-in release. Until then, it is important to be aware of the limitations in the currently released plug-ins. To efficiently work with checking profiles, there are some requirements that a plug-in should fulfill. Not all released plug-in versions meet these requirements. For more information about the requirements and how the plug-in versions meet these requirements, see the following tables. Users should be able to select the appropriate check profile. Users cannot select checking profiles directly. Instead, users select a writing guide, and the server looks for assigned checking profiles that use the same writing guide. If there are several matches, the server uses the settings from the most preferred checking profile. Users can select checking profiles directly in the plug-in interface. Users should only see the checking profiles that apply to them. Users cannot see checking profiles at all. Instead users can select writing guides that are associated with checking profiles. However, users can always see all writing guides. The writing guide menu also includes writing guides that are not used in checking profiles. When users open the checking profile menu, they see only the checking profiles that you have assigned to them. An administrator should be able to prevent users from checking with the wrong settings. When a checking profile is locked, standard users can still change their check settings for one session. However, when a user reopens the plug-in options or the editor application, the server resets the settings back to the matching checking profile. When a checking profile is locked, standard users cannot change the check settings in the plug-in interface. They can only change their check settings indirectly by switching between checking profiles. Additionally, not all released plug-ins have been tested with the new checking profile functionality. Acrolinx plug-ins have different degrees of support for checking profiles. The degree of support is based on the testing results and the range of functionality available in each plug-in. For example, many plug-ins do not require the user to configure extraction settings so these plug-ins ignore extraction settings that are configured in checking profiles. The following table displays all Acrolinx plug-in versions that offer full support for checking profiles. The following table displays all Acrolinx plug-in versions that of limited or partial support for checking profiles. Adobe CQ 3.0 Partial support. This plug-in can receive only the extraction settings from checking profiles. The check settings are ignored. However you can still configure default check settings in the plug-in configuration file. Adobe FrameMaker 2.9 Service Release 3 Supported with limitations. Adobe InDesign - Not supported. Arbortext Editor 3.1 Service Release 2 Supported with limitations. Eclipse (Mac and Windows) - Not supported. IBM Lotus Notes 2.0 Service Release 5 Supported with limitations. JustSystems XMetaL 3.2 Supported with limitations. Microsoft PowerPoint 3.2 Expected to work with limitations. Microsoft Word and Outlook 3.0 SR3 Supported with limitations. Oxygen XML Author 3.0.1 Partial support. This plug-in has the previously listed limitations as well as an additional limitation. Users cannot switch between checking profiles by changing writing guides. The check settings do not change when you switch writing guides. They match the check settings that are configured in the highest priority checking profile. Serna Enterprise XML Editor 2.9 Supported with limitations. Batch Checker 2.7 Partial support. The Batch Checker can receive only the extraction settings from checking profiles. The check settings are ignored. Additionally, the Batch Checker only receives the extraction settings when server-side extraction is enabled . Desktop Checker 2.0.3 Expected to work with limitations.